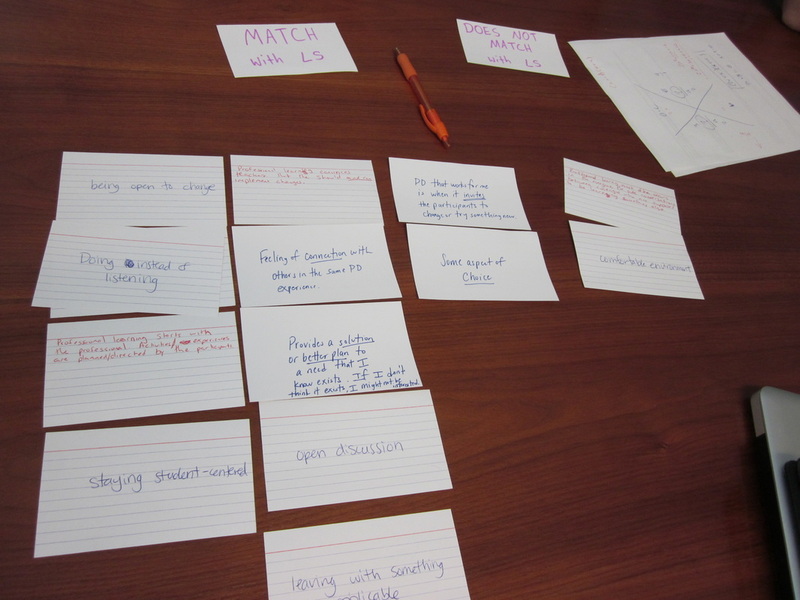 All 3 of our lesson study groups are currently in the stages of planning for semester 2! Instead of planning a second research lesson, the biology group opted to spend another full day at the Birch Aquarium with Melanie Villanueva and Cheryl Peach, revising their first semester lesson. Cristina Trecha, the director of the San Diego Science Project, spent some time with the group as well! Unlike the math groups, which could debrief and revise their lessons in an hour or two, the biology lesson required several hours to revise due to the variety of materials involved: data, photos, powerpoint slides, and maps. The biology group had a great day planning on February 1, 2014 and are ready to reteach the lesson on February 26, 2014 at Mar Vista High School. John Berray and the algebra group discuss via Google Hangout! Due to changes in curriculum at one of the school sites, the algebra group was unable to observe a second teaching of their first research lesson. Therefore, to get the ball rolling on their next lesson they opted to meet virtually via Google Hangout. John, Kellen, Collin and Melanie spent about 30 minutes discussing plans for the next research lesson. The group agreed to focus on the teaching of exponentials and will meet at UCSD on February 21, 2014 to plan the lesson and schedule the observation and debrief. The geometry group also decided to begin making second semester plans via Google Hangout. Since Chip and Anthony live only blocks away from each other, they met in person and chatted virtually with Joseph and Daniel. The group decided to focus on trigonometry for their second research lesson and will meet on March 3, 2014 to plan the lesson. The lesson then will be taught on March 17, 2014 in Anthony's classroom at Mar Vista High School. Lots going on at Mar Vista High this semester, which is also where Melanie used to teach - hence the connection between the geometry and biology groups! Check back soon for updated research lesson dates and for artifacts from second semester lessons! The Geometry Group is in Full Swing! Our Geometry group has been meeting after school at Castle Park High School, and engaged in their first meeting on October 22nd. Yesterday, they got together again to discuss their overarching research goal and to begin to narrow their content focus for first semester. The geometry group consists of (from left to right) Chip Case and Anthony Villanueva from Mar Vista High School, Joseph Hyun from Morse High School, and Daniel Crook from Castle Park High School. Chip and Anthony have worked together for the past 6 years and Joseph and Daniel used to be roommates during their time in the credential program at UCSD years ago. So, this group had an instant connection and worked together easily from the very beginning. Getting these 4 to talk about Geometry was no challenge whatsoever, and they eagerly jumped into discussions of student disposition towards problem solving, the new Common Core Mathematics Standards, and what they hoped their students would learn in their own classrooms. After some discussion, the team decided that they wanted their students to really understand what it meant to "think critically." They agreed that their students are told the importance of critical thinking in many of their high school courses, yet this group of teachers felt that their students didn't truly understand what that meant. Additionally, they wanted their students to persist in solving problems, which is directly related to Common Core Math Practice #1. Therefore, their research goal was written as, "To provide a learning experience for students that fosters the internalization of critical thinking and persistence." The Geometry group will meet again on November 12th to plan the specifics of their research lesson on abstracting angle relationships. With the advent of the Next Generation Science Standards, it's more important than ever for teachers to be provided with opportunities to engage in authentic science experiences. We are fortunate in San Diego to have access to world-class research facilities, and the Scripps Institution of Oceanography is one of the very best! At SIO, Drs. Nerida Wilson, Greg Rouse and Ron Burton are investigating the role that the Scotia Arc plays in connecting benthic marine invertibrate populations from South America to Antarctica. This work will help to contribute towards understanding biodiversity in Antarctica. Cheryl Peach, director of Scripps Educational Alliances, connected these researchers with the San Diego Science Project via the CREATE STEM Success Initiative and together we developed a plan for engaging biology teachers in authentic science and the process of Lesson Study. During the first day, the group spent the morning focused on the research of Antarctic marine invertebrates, determining relationships between species of starfish and sea worms between the tip of South America along the Scotia Arc to Antarctica. Dr. Wilson spent time detailing the research proposal, motivation for the work and the experience being at sea collecting and analyzing species. 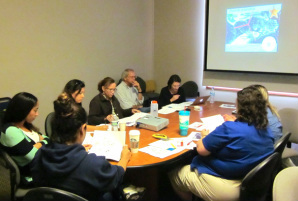 She then presented the teachers with data and gave them time to analyze the data and determine geographic barriers between species in the region. The 6 teachers (1 student teacher came along) were very much engaged during this time and had a wonderfully challenging experience working with the data! Dr. Wilson then discussed their findings with them and reviewed the project's own findings. Said one teacher, "Hearing the examples of what other teachers do stimulates my own ideas. Also, learning about how scientists interpret information made me think of examples to share with me students." 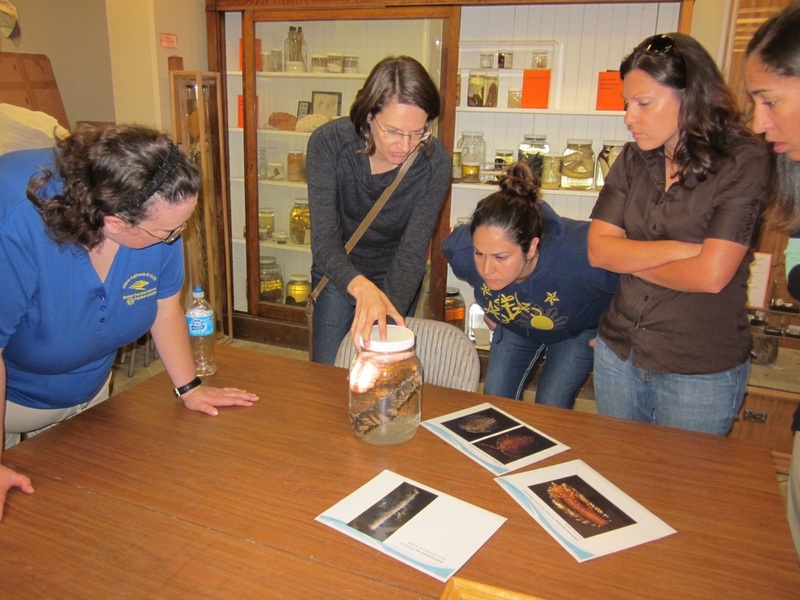 The group then went to the collections area and viewed some of the species that the researchers were investigating. It was pretty cool to check out the actual animals in jars! Dr. Burton then gave the group a tour of the lab area and discussed the DNA analysis that they can do in the lab. After an enjoyable lunch break, the afternoon was spent with just the teachers. The teachers spent time discussing the relationship of their work in the morning to NGSS, and then the group spent time examining and learning about the lesson study process. The group will meet again on November 23rd to spend the day collaboratively planning a lesson that incorporates the Rouse/Wilson/Burton research and NGSS science and engineering practices. On December 6th, the group is then going to observe the lesson at San Dieguito Academy taught by Jocelyn Broemmelsiek (as decided by the group) and will reflect on and revise the lesson afterward. 2nd semester, another teacher (TBD) will teach the revised lesson which will be videoed and disseminated to the teachers for analysis and final revisions. Dr. Wilson and Dr. Burton did a wonderful job connecting with the teachers and engaging them in the science in a hands-on way. They are great examples of how scientists can engage in work with teachers. At the end of the day, one teacher commented, "It is always a great experience and motivating to work with like-minded teachers. To be in a room with other teachers who want to improve their craft and dissect the teaching process is very empowering." Discussing past experiences with professional development. On Monday October 14th, our Algebra Lesson Study group got together for the first time in the Education Studies department at UCSD. The group consists of Collin Reinking from Bonita Vista High School, Kellen Slack from Guajome Park Academy and John Berray from West Hills High School. We were laughing about how our small group of 3 teachers hail from schools that couldn't be much farther apart! 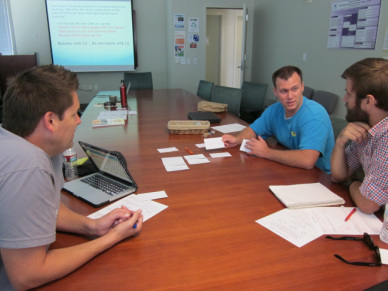 Collin teaches in Bonita (south), John is in Santee (east), and Kellen is in Vista (north). This will certainly pose a challenge when we observe the lesson, but I'm sure we can overcome this! The morning started with some time for all of us to get to know each other a bit. Chris Halter, the esteemed leader of the Noyce Program at UCSD, joined us for a short time in the morning and also generously offered to take us all to lunch! (Thanks, Chris!) 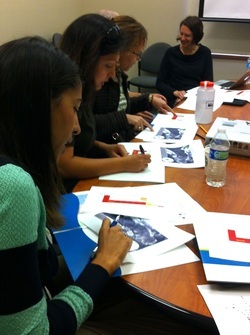 The group shared their paths to becoming a teacher and what drew them to study and teach math in the first place. It was interesting to hear the variety of experiences that everyone had that led them to the same place. We then spent the rest of the morning coming to a shared understanding of the lesson study process. We engaged as teacher-learners and analyzed the experiences of teachers in the "How many seats" lesson and video from the "Lesson Study: Step by Step" by Catherine Lewis and Jacqueline Hurd. Apparently, the "how many seats" problem is a very common example in mathematics, but the lesson study participants had deep discussion about the transformation of teacher thinking in the video. After some discussion, the group members distilled all of these ideas (and more!) and came to a final overarching research goal: For students to be able to communicate their ideas and use the critique of ideas as a way to improve their own understanding. The group will be meeting again at UCSD on November 8th in order to plan their research lesson and focus their observation questions. Before leaving, one teacher said "this is the first PD I've ever gone to where I didn't wonder at the end of the day why the heck I bothered to go." In terms of professional development, this is the highest complement possible!! I think we're all looking forward to our next session filled with lots of deep discussion about the nature of mathematics, student thinking, and the transition to Common Core State Standards. I can't wait! Characteristics of good professional development, as determined by participants. Look how many align with the practice of Lesson Study! If you're looking at this page, it's probably because you are interested in learning more about lesson study and are thinking about joining the Noyce Lesson Study project. In my experience, I have found lesson study to be one of the best professional development opportunities that I have ever engaged in. It asks you to think deeply about your practice - why you will say things a certain way to your students, what do you expect them to say in return? How will you know if students are gaining a deep understanding of processes or content? What evidence will you collect and how will you analyze it? Instead of "developing curriculum" or analyzing test data, lesson study allows teachers to explore and reflect on the heart of what teaching and learning is truly all about. Lesson study is also an incredible venue for developing strong teacher communities that are focused directly on instruction and learning. With a demanding teaching schedule and a myriad of additional responsibilities at school sites, teachers rarely have time to talk about and collaborate in their practice. Lesson study is so simple, yet can be so powerful. I hope that you will be able to join in our endeavor.